How many segregated bus lines are there? A February 2010 report by Hiddush found that there were at least 63 official segregated bus lines in Israel and 10 unofficial ones — at least 2,500 trips per day. Dozens more have apparently been added. While the bus is still in the heavily ultra-Orthodox city Bnei Brak, Chani Weiser asks herself whether to give in, move to the back and avoid the harassment and humiliation. “Usually when we get to Ezra Street I’m torn. I say to myself: ‘Maybe just move and that’ll be that.’ I’m mainly afraid that somebody who thinks it’s absolutely banned will get on and there’ll be a huge delay and a police car coming. “And then I think: Wait a minute — that’s not Jewish. That’s not okay. There’s no such thing in Jewish law. Why should I help a bizarre and degrading custom that imposes restrictions on me? So I stay in my seat, put on earphones and try to be polite and agreeable — to be invisible. A Haredi myth is that Haredi women really want to sit in the back of the bus, so we shouldn’t interfere with the community’s gender-segregated bus lines. Weiser is editor of the Haredi blog “Ha’agala” (“The Wagon”) — the name alludes to a religious metaphor about a full wagon and an empty wagon. The blog, which has been running for several months now, offers a new kind of platform for Haredi writing. “I’m not a feminist,” Weiser says. “I don’t believe in equal rights or extra rights. I completely understand the blessing in which a man gives thanks to God for not making him a woman. I accept my place in the Jewish social hierarchy, I don’t want to put on tefillin or take a man’s place in the leadership. Just one little thing — I don’t like sitting in the back of the bus. 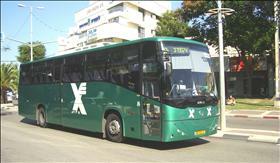 “I often have to ride the intercity buses to and from Bnei Brak. I usually get on at one of the first stops in this city of Torah and Hasidism, when the bus is empty, and I take a seat one row before the door, in a good spot in the middle of the bus. It’s very rare that I can sit there and be relaxed. A Haredi myth is that Haredi women really want to sit in the back of the bus, so we shouldn’t interfere with the community’s gender-segregated bus lines. “Even if no one says anything to me, they stare at me. They whisper and murmur. In the worst cases they shout at me, but usually they just ask, over and over again. They make me feel like a sinner who causes others to sin as well. “I politely answer ‘no’ when they ask: ‘Could you move to the back, to the special places for women?’ Sometimes I explain that there’s no such thing. The segregated buses only stop at stops in Haredi areas, even some out-of-the-way stops, and skip over stops in non-Haredi areas, even major stops. They expect secular and religious-Zionist women not to get on and cause problems. The proliferation of segregated bus lines in certain areas is badly damaging the quality of service to non-Haredi people. The Knesset Research and Information Center has found that the Transportation Ministry planned bus lines that skip important stops because these stops aren’t in or near Haredi areas. How many segregated bus lines are there? It’s very hard to know. A February 2010 report by the group Hiddush, of which I’m a vice president, found that there were at least 63 official segregated bus lines in Israel and 10 unofficial ones — at least 2,500 trips per day. Dozens more have apparently been added, though on some older lines the situation has improved and there’s mixed seating. All told, it’s very difficult to quantify the matter — and the High Court is largely responsible for that. In early 2011, in response to a petition by the Israel Religious Action Center, the court ruled that gender segregation on buses was illegal, though passengers could voluntarily institute it. The result: Since officially there are no gender-segregated lines, no one keeps figures on them. How many incidents of violence and harassment are there on the segregated lines? We don’t know that either. Three and a half years ago, the High Court ordered the Transportation Ministry to conduct regular inspections of bus lines suspected of being segregated, but the Knesset Research and Information Center has discovered that the ministry isn’t carrying them out.